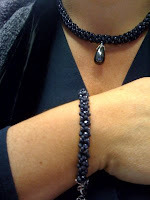 I liked that rope stitch necklace I made with the hematite drop, so I decided to make a matching bracelet. But I didn't want the bracelet to be a bulky as the necklace so I modified the stitch on my own to make the diameter of the rope smaller. I also used beading thread with the bracelet instead of fishing line, so the bracelet feels more supple and flexible, not nearly as rigid a body as the necklace (I used large gauge fishing line on the necklace). 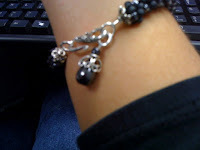 I used the exact same beads (what I had left over from the necklace) and I found a smaller hematite drop that I wanted to use too but I didn't want to suspend it from the middle like I did with the necklace so I added it like a fancy tag to the matching sterling silver S clasp. I am happy with how it turned out.